Thanks, DT. Hope you’re finding a break from the Cali heat. Well, it’s 76 F @ 35% humidity here in Portland, OR. 96 F @ 6% in Santa Barbara, CA. 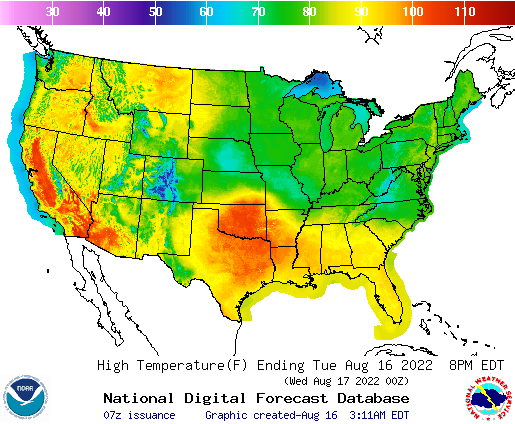 Hot and dry forecasts for the entire west coast. 40s during the day on Saturday will preclude travel problems. degrees above early October normals. Mangled Jet Stream. The weather forecasters need to consult DR. Francis. Cold air from Canada will invade the Plains and Midwest, with temperatures 20 degrees or more below normal across the region. Network news interviewed some of a whole new bunch of global warming alarmists. From Dallas to Chicago they’d just attended a lecture from our angered Mother Nature… But what does She know? Have to ask the question. When are we going to get an update on sea level? Nothing since last May. Probably a good idea to do a global update. Will probably blend it in with some rather stunning local figures as well. This link below is the only site I check periodically for sea level changes. They usually update every 1.5-2 months, but haven’t since the end of May. 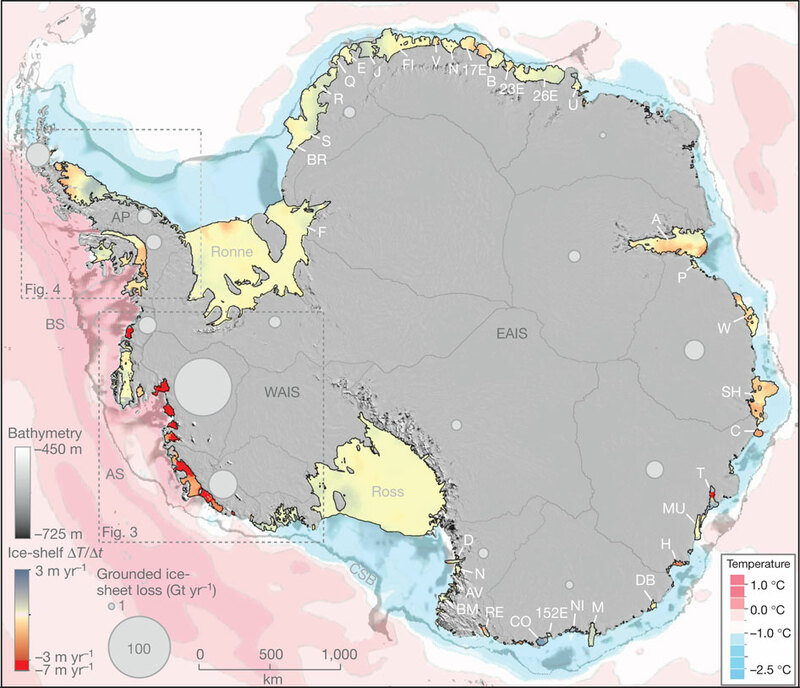 Are there any other reliable data sets for sea level rise? This post reminds me of how likely it would be for more antarctica sea ice when you consider all of that cold, fresh meltwater. It will unfortunetly be denier fuel for quite a while. We should remain well aware of the likely impacts of large fresh water outflows on basal ice, sea ice, the weather and the health of oceans as a whole. Could probably do with another fresh water outburst post as well. Thanks Robert, very appreciative of your posts as always. Sudden changes in sea level rise beyond ENSO related changes are something to watch out for as an early warning of increasing melt rates. One more thing before I check out. NOAA updated their MEI page today with new data (maybe I just realized it now but it seems new to me and very interesting). Interesting. So MEI shows us in weak to moderate El Niño for July and August. Thanks for posting the update, Bassman. All summer (southern hemisphere winter) the air temperature anomalies in Antarctica were pretty amazing. The peninsula and swinging down through west Antarctica has shown a high anomaly of 20+ for much of the cold season. With the weakened thermal density it should continue to exhibit effects as their summer begins. Looking at that jet stream reminds me of some of my younger days of inhaling and chasing a wandering stream of opium smoke with a straw. Anyway, it is generally the simple and direct truths such as Dr. Francis and her easy to follow workings of the jet stream (it’s like poetry), that confounds so many of our fellow citizens. Fantastic post Robert. I am fascinated by sea level rise. A King tide will visit Miami on October 9th. Should be an interesting prelude to the not too distant future for the city! Miami is already more than 1 foot higher than mid 20th century norms. + 4.5 inches during last 20 years alone. +0.8 inches during last year. I will add my various Santa Barbara, CA, USA sightings and observations as a tool for us to know some of the reasons many people and civil governments deny or refuse to acknowledge our present climate crisis, and its causes. But it show’s what one solitary and concerned citizen can observe and document. What happens, or is tolerated, on a small regional level indicates what also will take place on a larger, or global level. History tells us that cultures and societies do break down and collapse. All this, in spite of strong mechanisms in place designed to avert this. That was a long winded way to say that we shouldn’t look to a modern and educated American city like Santa Barbara for an example on how to survive. This applies to the state of California, and the USA itself. – For example, over a few weeks, I had been watching a certain plume of traffic dust in a sloping street gutter. This was summertime. A number of days after a rainy spell I checked a puddle of standing gutter water and noticed it was thick and gray. I wondered how toxic the water was. A few days later, I re-checked the puddle. While I was there, a Vector control worker came by to sample puddle. Zero, mosquito larvae were found. The worker/inspector was amazed. (She paid no attention to the gray water, it is usually clear.) She registered her finding in her log, and off she went to the next puddle. I did a cursory check of Vector info but saw no reference to contaminated water impacting the situation. So, the Vector ‘bean-counters’ made their tally, and that was that — “situation under control”. Denial, acceptance, ignorance — in a civil society? Robert, please let me know if I burden your comment section. No worries, DT. I enjoy the friendly discussion. Have you raised this concern with local authorities? Surely a bean counter would jump at an opportunity to justify their employment. I had to leave (flee) Santa Barbara two years ago after much back and forth banter with many levels of city, county, and state government on the buildup of black soot and traffic dust. At least every other day, I was finding an example of some sort of biological, botanical, or chemical damage or anomaly. On every damn block of the city. The ‘bean counter’ was fulfilling her duties. The ‘local authorities’ are just high ranking ‘bean counters’. I tried to educate them all on some basic physics and organic chemistry, which I learned in the field. If I had a legion of cohorts I might have had some more success. A repeated S.O.S. was sent but no one wanted to get their hands dirty, or tell people what they didn’t want to know. DT, though it looks like you got your hands dirty – literally! You did something, and it is having an effect – here. Did anyone sample that dirty water? I’d love to learn of the results, if any. Perhaps these toxic puddles can be sampled in the future, as I’m sure the situation has not improved – but for the lack of puddles due to the drought. benzene,soot, heavy metals, asbestos, sulfurs, and unknown cargo drippings, etc. This is why I put much effort into the subject. The lifeless puddle was just one more bit of evidence. Thanks. Amazing. Water so toxic even mosquitoes won’t touch it. Pertinent to your post I ran across a post at Climate Change National Forum by Mauri Pelto about the Pine Island Glacier. It’s an update on his 2009 RealClimate post. It’s from May so you may have already seen it but it has some details of the PIG and how vulnerable it is to rapid collapse. This and a number of other reports have sounded a death knell on the PIG. Nature report this year show this glacier and some of its fellows are in irreversible collapse. Thanks for posting. Regardless of the exact path of Phanfone, there’s increasing concern about the threat of heavy rainfall from this storm. The map above shows a computer model forecast for rainfall through Tuesday. The map gives a general idea of where heavy rainfall may fall, but it’s important to bear in mind that the official track forecast may differ from the forecast from any individual computer forecast model. Additionally, Japan’s steep terrain often leads to large variations in local rainfall that often aren’t captured by the global models, so the above map is only a general idea of where the heaviest rain may fall. Some of the areas in Phanfone’s path saw historic rainfall from the one-two punch of Tropical Storm Nakri and Typhoon Halong in August. The city of Kochi had over 61 inches of rain in August, its wettest month in records dating back to 1886. The rural hamlet of Shigeto in the mountains of Kochi Prefecture picked up 94.41 inches of rain, crushing its previous all-time record for any calendar month by nearly 40 inches. Those rainfall totals are just outrageous. I’m surprised the new Japan records for August weren’t more widely reported. Japan seems to have been the epicentre of extreme rainfall this year. Wonder how close many of its slopes are to sliding down. Second storm just behind this one. Yes, ‘Japan’s steep terrain’ can get torrents of rain orographic enhancement. We used to get that in Santa Barbara when the counter-clockwise rotation of a storm off of the Pacific would squeeze against the mostly south facing Santa Ynez mountains. Something of the opposite would happen in usually hot and dry off-shore events when the dry air would stack up on the other side of the mountains and then come rushing down towards the sea. They were called sun-downers. Newly released images created from NASA satellite data illustrate the staggering effect the California drought has had on groundwater supply in the state. The images show the amount of water lost over the past 12 years, with different colors indicating severity over time. -4 trillion gallons each year? Devastating. I’d been wondering when NASA would point its gravity sensor at California in an attempt to determine total water loss. ……hungry people. Some days I can’t spell my own name….. The MEI from NOAA is in at a flat .500 for Aug/Sept. The prolonged El Niño tease. Could go on for some months yet. SOI back to zero. Current Kelvin wave looks like it could keep surface waters on the warm side for some time. 2014 has highest running PDO values since 2003 — that is mildly positive. Researchers have created a “solar battery” by combining the energy-harvesting panel with the energy-storing medium at a microscopic level. The device could change the way solar power is used, though it still has much to prove. Ohio State’s Yiying Wu, professor of chemistry and biochemistry, led the team that made the breakthrough, which was reported this week in Nature Communications. The panel, like any other solar cell, produces electrons when struck by sunlight. But then, instead of having those electrons piped to a separate battery unit and leaking as much as 20 percent of them in the process, they built the battery right into the panel. The solar-sensitive part is porous, and gives access to a battery layer that attaches and detaches oxygen from lithium ions to store energy. “Basically, it’s a breathing battery,” Wu explained in a news release. And, strangely enough, the panel is tuned to a certain wavelength of reddish light by using iron oxide as a dust — also known as rust. Combining the production and storage of solar power could potentially reduce costs and make solar-powered devices compact. Very promising avenue. With solar, it’s a matter of how rapidly the materials sciences can advance. Lots of innovations ongoing. Substantial areas of warm air over northern Quebec, eastern Hudson’s Bay, NE Greenland, and Barrents Sea: Climate Reanalyzer Oct. 4, 2014. Arctic polar amplification ramping up. Quite a strong signal for early fall. Wild weather already ranging through parts of the northern hemisphere. This should intensify as we approach November. Wow, I can tell that Jet Stream is really “freaked.” Look at the homeless Arctic Vortex! The priorities of capitalism (the religion of Mammon) strike again. Global warmists have a problem, which they hope to solve through therapy–for others. …attitudes about so-called climate change are often a matter of “identity.” He even acknowledges that is true of liberals as well as conservatives–but whereas he sees the latter as a problem to be overcome, the former is a mere parenthetical. The implicit assumption is that identity-based viewpoints are problematic only inasmuch as they are “incorrect”–counter to global-warmist orthodoxy. That’s right, because melting glaciers and hothouse oceans are all about politics and psychology. My how the mighty Wall Street Journal has fallen It’s transformed directly from the cult of greed into the cult of ignorance, stupidity and babble. Amazing. And this is just what happens when it has detached from the local seabed, just a few meters away. Pretty clear all it takes is a little nudge to release this stuff. It’s a bit like watching dry ice melt — is it a gas, or is it a solid? There the entire 53 min. 2008 lecture on Youtube. I often download lectures, convert to mp3, then listen in bed on a player. This just made the monster even more real. I don’t know how anyone could watch that and dismiss these hydrates as not being a huge risk. Weather warnings issued for Monday in western UK as first major storms since winter mayhem barrel in from Atlantic. Jet stream forecasts look like there’s a fair bit of weather heading our way. The map above shows the RPM computer model forecast for rainfall through Tuesday morning local time. The map gives a general idea of where heavy rainfall may fall, but it’s important to bear in mind that the official track forecast may differ from the forecast from any individual computer forecast model. Additionally, Japan’s steep terrain often leads to large variations in local rainfall that often aren’t captured well by computer models. Indeed, in areas where winds blow perpendicular to the steep terrain, rainfall amounts could easily double what’s shown above. JMA forecast bulletins are predicting anywhere from 500 to 800 mm (roughly 20 to 32 inches) of rain in the Tokai region, including the Nagoya metropolitan area, Japan’s third largest, with roughly the same population as Chicagoland. Other parts of Japan’s Pacific coast could see generally 200 to 600 mm (roughly 8 to 24 inches) of rainfall. The jet stream seems to turn back on itself over Hudson’s Bay, breaks off, then heads straight off towards southern Greenland and to the UK. It’s like a bizarre Chinese New Year. The dragon is chasing its own tail. That is amazing! I can only imagine this winter’s weather for upper Midwest and North Eastern USA. It really does seem that a warming arctic sea and land surface is taking away the driver of a stable jet stream. And that we might not see a stable jet stream again anytime soon. Of course Government, Industry and Media will act in concert to suppress this type of information. It’s not about censoring it, it is about getting it to the back page so to speak, just under the local bowling league scores! At least half of government is now not involved in active suppression. It’s primarily those who are ideologically opposed to government response who are involved in suppression at this time. Ridge west, trough East. Cut off upper level heat low over California. Note the strong dip into the North Atlantic south of Greenland coupled with storm track intensification toward northern UK. Strong dig moving through Hudson Bay means ‘the gales of November’ may well come early for the Great Lakes. Super Typhoon Phanfone can be seen south of Japan in this false-color satellite image taken Saturday, Oct. 4, 2014.NOAA. Thanks, Apneaman. Am giving it a listen. I sense an extra twisted form of ‘American Exceptionalism’. Heavy blow aimed at Japan. Potential new storm threat to the south and east as well. Lets hope it misses this little hot spot! This really is incredible information! How much longer can the “big lie” be maintained by fossil fuel interests and their captive media mouthpieces? Here is a short news bit I picked up on the economics blogs, a bit off topic, pertaining to California, which seems to be approaching a mega disaster if weather patterns don’t change, and change fast! First big threat. Brace for migration pressure from these regions. That’s right. I’ve watching for more signs up here in PNW, Oregon. Solar desal tech is on the table. How quickly is the harder question. ” Ocean stratification. A condition characterized by the separation of layers of water of different temperatures and chemical make-up. A condition that has serious impacts to the geophysical nature of the worlds oceans, to the ability of oceans to support life, and to the stability of the vast glaciers of Antarctica — whose faces plunge as deep as hundreds of feet into the Southern Ocean.” This information makes me wish I was still in the Navy and engaged in Submarine and anti Submarine warfare. These guys will be recording all these changes in the upper ocean layers. I can see entire areas becoming totally blind to surface vessel sonar, unless variable depth. These hard and fast layers provide shelter for any Submarine and make zones where only other Submarines can engage each other. I am sure that upper levels of command have been watching the changes as data pours in every day from Surface and subsurface naval vessels operating across the oceans of the world. The arctic seas are becoming a hot bed of naval activity and that means a steady stream of ocean data flowing in to USN and Russian Federation Navy commands. Exciting, but very disturbing times! Oh, yeah. USN has been on top of this for a long time. Jeremy Jackson relates his ‘encounter’ with USN about ocean chemistry. USN said “it’s far worse” than Jackson’s data. The intel/leadership types in the US Navy and broader US military have been well aware of the heightening risks for some time. There’s been a pretty intense non public and occasionally public effort on the part of these military members to wake the US civilian leadership up for some time now. What kind of kills me about conservatives is their increased deafness to a military they profess to be 100% behind. Very good lecture, btw. Thanks for posting. Much thanks! I am taking the time to view in full! Sub warfare types will see this increasingly stratified ocean at the poles expanding toward the equator. At the edge of the fresh water wedge will be a strong down-welling zone where the warmer, saltier water dives down below the fresh water layer. At the equator — more evaporation and production of hot, salty water. It would be nice to know just what the temperature/ pressure changes were in this clip. One could see the oceans violently boiling , given how fast the phase change was in this short 2 minutes. I don’t know exactly but here is a general description from The World Ocean Review. Thanks for that , the more I learn about Methane hydrates, the less I know. I think what probably ends up happening is that the layer destabilizes but most of the pressure builds up until it violently bursts out. So you end up with the plumes we now see first and then a kind of sea bed eruption as sections of sea bed are violently thrust up and the larger destabilized pool releases. My opinion is that rate of sea bed warming is probably at least as important as total warming. Under slow warming, the destabilized portions have more time to find fissures and cracks through which to slowly relieve pressure. But under rapid warming, there is less opportunity for non catastrophic pressure release. Like we see saw in Siberia this summer on land. But the chunk , seemed to react because it was removed from the parent mass. That would indicate the the entire mass is just above out gassing. and in the first images we saw it as “egg whites floating in boiling water”. Clearly they were after a sample, seeing that first chunk float away , was scary as well. The message is that all this is in a finely tuned balance . And it all floats in sea water. It’s scarey clip , if one knows the geology of the Earth. I got think there were huge deposits of Methane hydrates the Permian Seas. And when the Siberian Traps flowed up through those coal deposits. , that was all the oceans needed for their Methane hydrates to release their stores of carbon on the sea floor , and add to the Permian train wreck . It was the last major glaciation to hothouse event. Before now. And now we could set off Permian type warming in only a few centuries — 1880 to 2180. Methane hydrates, are in delicate balance of pressure and temperature. If either one changes , the lattice they form goes through a phase change. And the carbon they store goes some place else. These phase changes are the key . Take water . It has 3 phases , that carries energy as it is being moved through the system. Same thing with that clip , Methane has has it;s own system of phase changes , and like water a great deal of energy is moving from one place to another. Hydrate phase change is lattice solid to gas. One of the properties that makes it so potentially nasty. Scientists at the U.S. Department of Energy’s Argonne National Laboratory have created a new model to more accurately describe the greenhouse gases likely to be released from Arctic peatlands as they warm. Their findings, based on modeling how oxygen filters through soil, suggest that previous models probably underestimated methane emissions and overrepresented carbon dioxide emissions from these regions. It looked to me like the clathrate and robot was moved. Could ascending just a few feet relieve enough pressure to start the process? What about temp changes from the same few feet? I would not be surprised if some of the gov/industry clathrate energy projects know this, since there have been a number of them trying to figure out how to commercialize the stuff for the last 30 years. Seems like there should be a lot of research materiel on the subject. Mount Ontake has 2 feet of ash on it at 10,000 feet. JMA forecast bulletins are predicting anywhere from 500 to 800 mm (roughly 20 to 32 inches) of rain in the Tokai region, including the Nagoya metropolitan area, Japan’s third largest, with roughly the same population as Chicagoland. Brutal. Let’s hope we haven’t seen root system degradation in that region similar to what’s occurred in other regions of the world. Just saw this, a really big deal. We are up to our asses in big deals all over the world . And TMZ rules our fate. How is man good for the Earth ? I think the bias is generally conservative overall. Not a good bias to have if your goal is to reduce risk and prevent harm. By combining these calculations, the scientists found that the rate of upper-ocean warming between 1970 and 2004 had been seriously underestimated. That inaccuracy is specific to the Southern Hemisphere, but is big enough, the scientists suggest, that global upper-ocean warming rates are also “biased low” – to the tune of 24% to 55%. The deniers always claimed there was bad math, they were are right , we missed out bad it was by – the tune of 24% to 55%. Read up on what is called “specific heat”, That will tell you a lot , water carries more heat than air ever dreamed of. Water has the the rating of ” one” on the specific heat scale . Everything else is measured against it. The only things that store more heat than water are salts than go through phase changes . Nothing in nature stores more heat than water. Exactly. And that’s what’s delivering all the melting force to glaciers. That’s what’s delivering all the destabilization force to the hydrates. This has major implications to what will happen to both oceans and atmospheres and for our observations as they are currently ongoing. @ClimateOfGavin: @SJvatn …but since it changes estimates of the recent ocean heat uptake, it pushes estimates of sensitivity higher. Esp. for L&C. A real BFD, this changes things in an alarming way. minimum of 3C if this is true. Second Figure is the key and in my opinion most shocking chart. See below. Essentially the planet has gained 35-45% more energy since 1970 than previously thought, Trenberth’s missing heat indeed! In the southern ocean. Brutal ocean system warming… Just brutal. This ain’t exactly new and I think we need to acknowledge social, career, and financial pressures as well. One has to wonder what has been going on since 2003 in the Southern Ocean. How much ocean heat has been buried from the Pacific or Atlantic in these oceans. I don’t understand enough about the currents to give any kind of answer. In the Southern Ocean, we have the warm, salty equatorial currents encountering the fresh water outflow originating from Antarctica. The warm saltier water is driven below this outflow in high volume. The net result of this mechanism would be to drive more heat into the Southern Ocean. It’s also worth noting that both observation and modeling confirm the Southern Ocean is a powerful heat sink. That’s why when water moves through it’s phases it’s so important . We have no clue the amount of energy it takes to drive one water molecule off the ocean and take it to Greenland, and condense it to snow. But the real key to all this , heat seeks cold even if the cold is at the top of world The top of troposphere Our the bottom of the world . Heat seeks cold. It’s old law, and we didn’t write. That’s the best science I ever wrote on your blog . Off to watch the Simpsons. 🙂 well done, sir. And certainly well worth thinking about. Yes, very good. Straight, and to the point. (I’ve been saving up that one. Maybe from an old Sherlock Holmes yarn. The perfect murder weapon. @ClimateOfGavin: . @sjvatn Impact of Durack et al increase of ~40% in OHC on L&C 5-95% ECS goes from 1.1-4.1 to 1.1-6.1 (preliminary calc). Just in, could you translate this. Robert? Why would the lower bound range stay so low? The lower bound ECS range seems to assume little or low positive feedback response from ocean heating. Averaging ECS changing from 2.6 to 3.6 is a rather big deal, though. Especially for the modeling science and for how much the Earth may ultimately warm this century. It’s also more fodder for dealing with those pesky arguments that have come out of the whole ‘hiatus’ discussion chain and related nonsense. That the location of this added heat is in close proximity to all those destabilizing and irreversibly collapsing Antarctic glaciers is also an indirect validation of that line of science. The glaciers are going down more rapidly than expected and there’s more heat than we initially thought. The other Nature study today seems to suggest that less of that OHC is going into the lower depths. Does this make sense? I find it disturbing because it suggests that Heat will remain in the upper levels much longer melting Ice and influencing surface temps (Nino and Hurricanes). In the short term it would be much better for this OHC to be buried at lower depths but maybe there is a natural mechanism preventing this. Really need to read a text book on ocean currents. Remember, upper ocean is the top half mile of water. So you can still have a 100 foot deep cold surface layer due to freshening and melt outflow even though the aggregate 2,500 foot column is warming. In my view, it’s better to have heat in the atmosphere than heat in the oceans, deep or shallow. @ bassman, are you referring to this one? Tulare county is pretty much out of water. Towns in the county are dry. 100,000 more wells to go dry this month here in CA. We’re approaching that line pretty fast. West Coast block is as strong as ever. Highly recommend it. We have lost so much, and stand to lose so much more. I was out watching pilot whales and bottle nose dolphins a few days ago, a mere handful but a huge privilege – but to read the accounts of the abundance of life in the oceans in times past I find almost unbearably poignant. Unrelated to the article, but something I’d like you all’s thoughts on. A sentiment I find repeated in comments against measures on climate and pollution is this feeling of being punished or controlled; “the left wants to tax us”, for what they believe are incorrect predictions; “scientists were wrong about the sea ice disappearing”, etc. The second sentiment is, of course, misguided, but I wonder if something can’t be done about the first that would do more to effect immediate and even welcome change. It makes sense to me that climate change action should be rewarded more so than inaction punished. Something should be done to provide readily tangible incentives to drive down pollution, consumption, and/or reproduction, say, write-offs on your income and property tax for conserving fuel and energy; for taking public transportation; for not flying; getting paid or not taxed as much for another year of not having children? We need to remove this stigma that taxation is bad. Taxes help support both decent jobs and positive action. In some cases, you need to give something in order to get something back. In the case of both climate change and Ebola it is the ideological push against taxation/revenue generation that has left governments, communities and civilizations vulnerable to scaling and non-linear impacts from out of context crises. In general, the continued starvation of public entities to benefit increasingly more monopolistic private interests is not at all helpful. As for where the money will come from — the investment sector is massively inflated these days. Adding a progressive capital gains tax on the income tax scale would be vastly helpful for revenue generation. One other point — Hansen’s tax and transfer directly taxes carbon emitters while sending the money to the consumer who is then empowered to purchase non-carbon based energy sources. Probably the kind of tax/incentive scheme that would have very wide-ranging benefits while reducing net consumption. Here’s a bit of good news re: ozone (mostly ground level). (Reuters) – The Supreme Court on Monday rejected an industry challenge to U.S. Environmental Protection Agency regulations issued by Republican former President George W. Bush’s administration that set standards for ozone pollution. By declining to hear the case, the court left in place the so-called primary air quality standards designed to protect public health, which Democratic President Barack Obama’s administration defended. I see these ads everywhere. I think we should push a campaign to add warning labels to fossil fuel based advertising.